Francesco Moser was the first man to break the 50 km/h barrier. Eddy Merckx, the last rider with a “normal” bike, clocked 49.431 km in 1972. 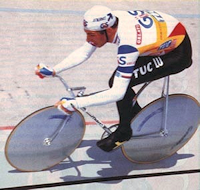 Moser used disc-wheels and a bullhorn-bar. This would become the standard time-trial equipment in the next years. I show his second attempt, where he reached 51.151 km. Not a very smooth ride. 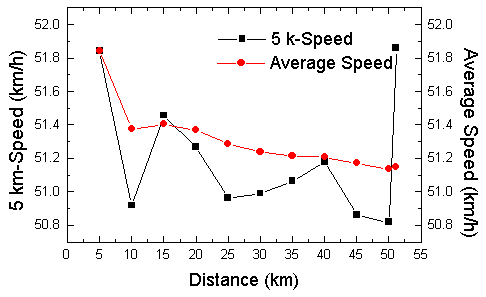 His 5-km speed is going up and down, sometimes below 51 km/h, sometimes more than 51.5 km/h. Like a lot of other riders he increased his speed dramatically at the end of the hour.